Washington(ANN)-North Korean leader Kim Jong-un’s right-hand man has met with Donald Trump in the Oval Office of the White House to deliver a letter from his leader to the US president about their upcoming summit. 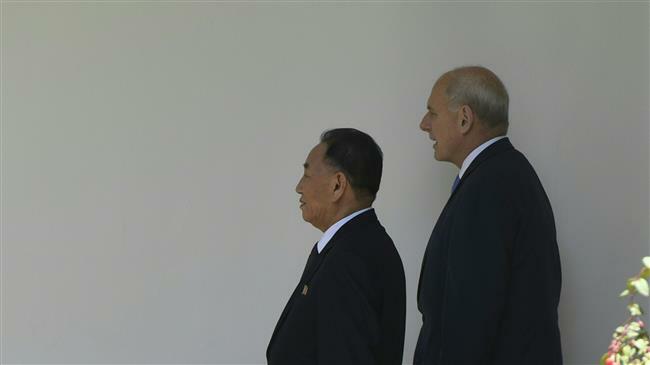 The vice chairman of North Korea’s ruling Workers’ Party’s Central Committee, General Kim Yong-chol, was greeted by White House Chief of Staff John Kelly on Friday, according to AFP. Kelly led the visitor to the Oval Office for talks with Trump and Secretary of State Mike Pompeo, White House spokesperson Sarah Sanders said. Kim arrived in Washington from New York, where he met with Pompeo on preparations for the summit scheduled for the June 12 summit between Trump and North Korean leaders in Singapore. After Thursday’s talks, Pompeo expressed confidence that the process was moving in the right direction, but he urged that the North Korean leader to be bold enough to make a “strategic shift” and give up nuclear weapons. “It will take bold leadership from Chairman Kim Jong-un if we were able to seize this once in a lifetime opportunity to change the course for the world,” Pompeo said. “President Trump and I believe Chairman Kim is the kind of leader who can make those kinds of decisions, and in the coming weeks and months, we will have the opportunity to test whether or not this is the case,” he added. General Kim landed at Beijing airport on Tuesday and will continue on to New York on Wednesday after talks with Chinese officials, Reuters reported, citing South Korea’s Yonhap news agency. The White House also said that a “pre-advance” team would meet North Koreans in Singapore. President Trump’s policy on North Korea, like so much of his presidency, has been shrouded in secrecy and confusion. One day he cancels the summit with Kim and the next day he says productive talks are underway to prepare for the meeting. On Sunday, Trump praised North Korea’s “brilliant potential” and said his team arrived in North Korea to arrange for his possible meeting with Kim. “Our United States team has arrived in North Korea to make arrangements for the Summit between Kim Jong-un and myself. I truly believe North Korea has brilliant potential and will be a great economic and financial Nation one day. Kim Jong-un agrees with me on this. It will happen!” Trump tweeted. The summit announcement came after several months of unprecedented cordial diplomacy between South and North Koreas, which had been adversaries for decades. The United States, which has substantial presence in South Korea, was on a war footing with the North over Pyongyang’s nuclear and missile programs. The development resurrected hopes that Trump and Kim could soon meet to try to find a solution to the crisis on the Korean Peninsula that has escalated over the past year. North Korea dismantled its sole known nuclear test site last week in an array of explosions. The Punggye-ri test facility has been the staging ground for all six of the North’s nuclear tests, including its latest and by far most powerful one in September last year, which Pyongyang claimed was a hydrogen bomb.